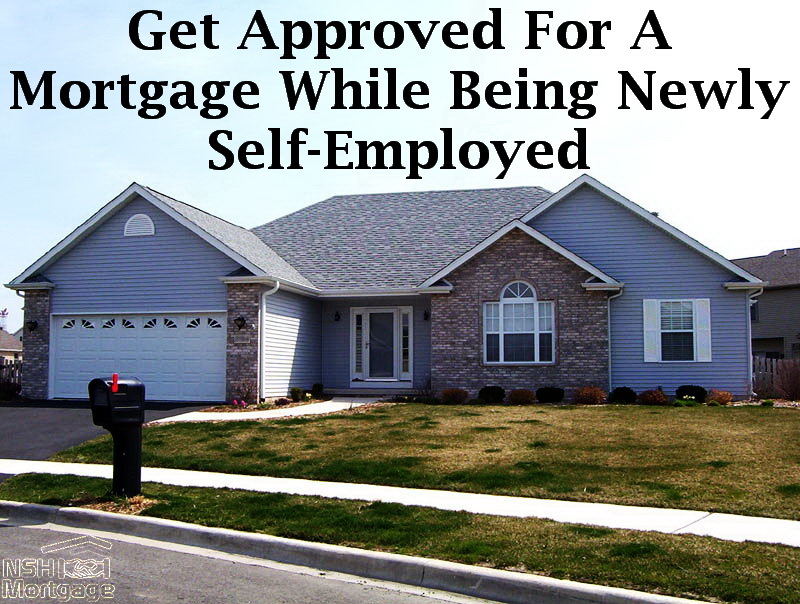 Get Approved On A Mortgage While Being Self-Employed. NSH Mortgage has the wisdom and tools to get you approved on a mortgage when your self-employed. Self-employment is both exciting and challenging. You make your own hours and you have the potential to increase your income. There is satisfaction in building your own company rather than someone else’s. One potential challenge of being self-employed, though, is getting a mortgage. For one tax write offs reduce the amount of income that the mortgage underwriter can consider. And, self-employed mortgage applicants must prove stability of employment and income, usually going back two years. This is a bit tougher than it is for regular salaried employees. Fortunately, there is a way to use just one year of tax returns to qualify for a mortgage. This can help newer business owners, as well as those who experienced a down year in the past. Whether you are looking to buy a house or refinance one, you may be able to qualify by showing only your most recent year of income. A self-employed borrower is any individual who has 25% or greater ownership interest in a business. According to conventional mortgage guidelines, underwriters consider the following factors to approve a self-employed borrower. Two points stand out here when getting approved as a business owner: stability and consistency. The way underwriters measure stability is by looking at length of history in that business specifically, and in that field. They typically want to see a two year history in the respective industry. This is where you may be granted an exception if you have not been self-employed the whole two years in that line of work. To see who might qualify for a loan with only one year of self-employment, we will look at two situations and how an underwriter would handle them. The following two scenarios describe applicants for whom the mortgage underwriter would likely make a different approval decision. Due to previous lines of work, one would need two years’ experience running their own business, the other might only need one. This applicant is looking to buy a house and has been self-employed as an insurance broker for one year. He has done well and has made over $100,000 in his first year in the business. Before getting into the insurance sales business he was a successful grocery store general manager. In his previous role he made $90,000 annually for many years. However, the underwriter is unable to approve the mortgage because the two industries are not related. A grocery management role is not similar enough to that of an insurance broker. The applicant is off to a good start, but his income is still viewed as unstable. Here, the borrower will need a two year history of self-employment in the insurance business before he will be eligible for a traditional mortgage. A borrower is looking to buy a house and has owned her web design business for 14 months. She has a full year tax return that demonstrated that she made $80,000 in net profit in her first year in the business. Before going off on her own, she worked for a large online marketing firm as a web development team leader for several years and climbed the corporate ladder. She averaged $70,000 year for the last two years before she left the company, and decided to go off on her own. This type of scenario demonstrates stability and would likely be approved assuming the applicant supplied the right documentation, such as a tax return and year to date profit and loss statement. Sometimes, the underwriter will not ask you to provide a full two years worth of tax returns. Most applicant files are run through computerized underwriting systems, then verified by real person. The underwriting software, sometimes, will ask for the most recent year of tax returns only. The one year requirement typically comes from Loan Prospector, which is Freddie Mac’s loan approval software. Fannie Mae’s version of the software is less likely to give you an one year requirement. Most lenders can approve loans via Freddie Mac or Fannie Mae. If you have been self-employed less than two years, ask your lender to try running your scenario through Loan Prospector. There is a chance these systems will require you to document less self-employment than would another system. If you receive the reduced, one year requirement, it is important to understand that your tax return must reflect a full year of self-employment income. For example, if you became self-employed in April 2015, that year’s tax returns are not going to reflect a full year. If you started your business in November 2014, then your 2015 tax returns will demonstrate a full year of experience running your business. Freddie Mac’s Loan Prospector helps those who only have the one year of self-employment under their belt, but also those who had a down year in the past. By using one year of tax returns, the underwriter does not have to average self-employed income over a two year period. For example, your business had an one off, slow year in 2014 where the net income was $50,000. Perhaps you took some time off, experienced a change in the industry, or moved your business to another state. The next year, you bounced back, and the net income was $80,000. If the lender were to require two years of tax returns, your income would average out to about $5,400 per month. But if in just one year of tax returns were requested, you would provide your most recent tax return. This assumes the year to date profit and loss statement demonstrates continued profitability. The qualifying income jumps to $6,600 per month based on the most recent year. The higher income allows you to buy more houses, or better qualify for a standard or cash out refinance. Buying a house while self-employed can be more challenging than it is for the average salaried employee. But if you can understand how underwriters view self-employed applications, you can prepare yourself for great success. If you are turned down for your mortgage, do not give up. There could be a simple solution that your lender has overlooked. Apply again with a different lender, asking about the options presented here. You might be surprised at how quickly another lender can approve your loan when another could not.